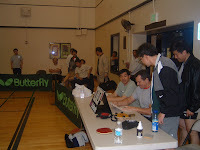 Milpitas Sports Center (MSC) hosted the very first U1900 division USATT Team League match this past Tuesday 1/23/07 as IGoLogic Innovation met MSCTT Team A. Both these teams are based out of MSC so there would be no home court advantage for either team. IGoLogic Innovation fielded a lineup that was familiar with the Olympic format used for this tie since it consisted of three of the members of the infamous Four Musketeers that took second place in the second division at the US Open Teams event held in Reno last year (second only to the USA Junior Girls team) --- Gary Fang, Michael Liu, and Mark Johnson. MSCTT Team A would meet this challenge with a lineup of Raymond Yip, Radu Licea, and Hyung Min Kim. Gary Fang faced Raymond Yip in the first singles match. Both these two enjoyed success in 4-star NATT tournaments held recently in Berkeley with Gary winning the U1850 event at the 2006 Western Open in February and Raymond reaching the U1850 final at the 2006 Berkeley Open in September. Gary seemed to have the match in his control after winning the first game 11-4 but Raymond responded with an 11-8 victory of his own in the next game signalling his intent to put up a fight. However, Gary started to return more serves with the long pips on his reverse penholder backhand at this point and this gave Raymond fits. Gary used this strategy to take the third game comfortably 11-5 and was able to hold on to win the fourth 12-10 to win the opening match of the tie 3-1. The next singles match had Michael Liu meeting Radu Licea. Both of these players also have had success in recent USATT sanctioned tournaments. But Michael won the U1850 event at both the 2006 San Diego Open and the 2006 Golden State Open in Concord in May while Radu won the U1100 and U1300 events at the 2006 Golden State Open (and 17 of his 18 matches!). However Radu has been receiving coaching throughout the year and has been improving steadily as not only his USATT tournament results but his play in the MSC singles league would attest so a competitive match was expected despite the ratings difference in their championships. Michael won the first game narrowly 12-10 and the second game comfortably at 10-4 with his consistent forehand and backhand topspinning. However, as the match wore on Radu was able to control more of the rallies by blocking the topspins until he could get a loose ball to kill. This allowed Radu to win the next two games 11-7 and 11-8 and send the match to a fifth game. This match would probably go in favor of the player that could get the best start in this deciding game. There was no question about which player this was as Radu rattled off the first 10 points (!) before eventually winning it 11-1 and the match 3-2. The tie was now all even at 1-1 as it went to what would now be a critical doubles match. Mark Johnson paired with Michael Liu for IGoLogic Innovation while Hyung Min Kim paired with Radu Licea for MSCTT Team A. The IGoLogic Innovation pair had at least some experience together having played doubles at least once at the US Open Teams competition in Reno while this was the first time the MSCTT Team A pair had ever played doubles together in competition. Despite this, MSCTT Team A took the first game 11-7 by returning serve better and excellent close to the table blocking. However, the key game of this match was the second as IGoLogic Innovation won it in a nail-biter 12-10. So the match was even at 1-1 where instead it could have easily been 2-0 for MSCTT Team A. IGoLogic Innovation took control of the match from that point and won the final two games 11-7 and 11-8 to win the match 3-1 and give it a 2-1 lead in the tie. 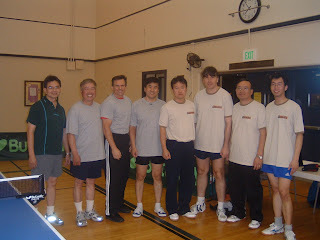 IGoLogic Innovation had a chance to clinch a victory in the tie in the next singles match as Gary Fang faced Hyung Min Kim. However Hyung Min Kim seemed determined to send the tie to a deciding fifth match as he got off to a great start by winning the first two games for MSCTT Team A by scores of 11-5 and 13-11. However Gary was not discouraged by the close loss in the second game. In fact, it appeared to motivate him as he responded by winning the third game 11-0 (!). Despite his best efforts Hyung Min Kim could not reverse the momentum in the next two games as Gary won them 11-7 and 11-5 to win this match 3-2 and assure IGoLogic Innovation of victory in the tie with its 3-1 lead and only the final --- and now anti-climatic --- singles match to come. Mark Johnson faced Raymond Yip in this match. Mark Johnson was fresh from his 2nd place finish in the U1800 event at the USATT Nationals this past December so this would be a match between the runner-up of a 4-star U1850 event (Raymond) and the runner-up of a 5-star U1800 event (Mark). These two had never faced each other in competition previously. This situation generally favors Mark since his service can take some getting used to by his opponents. This was indeed the case in the first game as Mark took it comfortably 11-6. However, Raymond seem to have adapted as he led 6-2 in the second game --- only to see Mark rattle off the next eight points (!) to lead 10-6 --- before he recovered to win the next four points (!) to send this back-and-forth game to deuce. But Mark was able to recover from his miss of a smash that had sent the game into deuce in the first place by winning the next two points to win the game 12-10 and lead in the match 2-0. But Raymond fought back to win the next game 13-11 and force this match into a fourth game. This game was all even at 5-5 --- attesting to what had now become a hard fought battle --- before Mark was able to pull away for an 11-7 victory and thus win the final match 3-1.